For other uses, see George Cross (disambiguation). Obverse of the cross. Ribbon: 1½", dark blue. "... acts of the greatest heroism or of the most conspicuous courage in circumstances of extreme danger." Height 48 mm, max. width 45 mm; (Obverse) plain silver cross with circular medallion in the centre depicting the effigy of St. George and the Dragon, surrounded by the words "FOR GALLANTRY". In the angle of each limb is the Royal Cypher GVI; (Reverse) plain, centre engraved with name of recipient and date of award. Cross attached by ring to bar ornamented with laurel leaves, through which the ribbon passes. Military ranks are a system of hierarchical relationships in armed forces, police, intelligence agencies or other institutions organized along military lines. Military ranks and the military rank system define among others dominance, authority, as well as roles and responsibility in a military hierarchy. The military rank system incorporates the principles of exercising power and authority, and the military chain of command – the succession of commanders superior to subordinates through which command is exercised – constructs an important component for organized collective action. The monarchy of the United Kingdom, commonly referred to as the British monarchy, is the constitutional monarchy of the United Kingdom, its dependencies and its overseas territories. The current monarch and head of state is Queen Elizabeth II, who ascended the throne in 1952. The George Cross was instituted on 24 September 1940 by King George VI. At this time, during the height of the Blitz, there was a strong desire to reward the many acts of civilian courage. The existing awards open to civilians were not judged suitable to meet the new situation, therefore it was decided that the George Cross and the George Medal would be instituted to recognise both civilian gallantry in the face of enemy action and brave deeds more generally. The Blitz was a German bombing campaign against Britain in 1940 and 1941, during the Second World War. The term was first used by the British press and is the German word for 'lightning'. The George Medal (GM), instituted on 24 September 1940 by King George VI, is a decoration of the United Kingdom and Commonwealth, awarded for gallantry "not in the face of the enemy" where the services were not so outstanding as to merit the George Cross. Percy Metcalfe, CVO, RDI, was an English artist sculptor and designer. He is recognised mostly for his coin designs and his contribution to the Ashtead Pottery Collection. The London Gazette is one of the official journals of record of the British government, and the most important among such official journals in the United Kingdom, in which certain statutory notices are required to be published. The London Gazette claims to be the oldest surviving English newspaper and the oldest continuously published newspaper in the UK, having been first published on 7 November 1665 as The Oxford Gazette. This claim is also made by the Stamford Mercury (1712) and Berrow's Worcester Journal (1690), because The Gazette is not a conventional newspaper offering general news coverage. It does not have a large circulation. The Medal of the Most Excellent Order of the British Empire for Gallantry, usually known as the Empire Gallantry Medal (EGM), was a British medal awarded for acts of the gallantry that did not reach the standard required for the Albert Medal and the Edward Medal. King George V introduced it on 29 December 1922. Recipients were entitled to use the post-nominal letters "EGM" and as a Medal of the Order of the British Empire it was also divided into military and civil divisions. Unlike appointments to the Order of the British Empire it could be awarded posthumously. The Edward Medal is a British civilian decoration which was instituted by Royal Warrant on 13 July 1907 to recognise acts of bravery of miners and quarrymen in endangering their lives to rescue their fellow workers. The original Royal Warrant was amended by a further Royal Warrant on 1 December 1909 to encompass acts of bravery by all industrial workers in factory accidents and disasters, creating two versions of the Edward Medal: Mines and Industry. The George Cross has, on the express instruction of the Sovereign, been awarded, to the island of Malta and the Royal Ulster Constabulary (RUC). To honour her brave people, I award the George Cross to the Island Fortress of Malta to bear witness to a heroism and devotion that will long be famous in history. By God's help Malta will not weaken but will endure until victory is won. 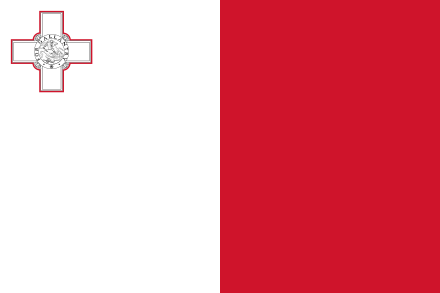 The George Cross was incorporated into the Flag of Malta beginning in 1943 and remains on the current flag adopted at the country's independence in 1964. There have been 10 GCs awarded to Canadians including those by substitution for awards superseded by the GC. The recipients comprised nine men and one woman. The GC is no longer awarded to Canadians by the Queen of Canada, who awards the Canadian Cross of Valour instead. The George Cross was awarded to 22 Australians, 11 to the Australian forces and 11 to civilians. It is the highest decoration of the Australian Honours System after the British Victoria Cross and the Victoria Cross for Australia. Although Australia established the Cross of Valour within the Australian Honours System in 1975 'for acts of the most conspicuous courage in circumstances of extreme peril' it was not until 1992 that Australia officially ceased recommending British honours. During the period 1975 to 1992, the last George Cross to an Australian was awarded in 1978. Of the 22 awards, 14 were direct awards and eight were Empire Gallantry Medal (two) and Albert Medal (six) exchange awards. Four awards were to officers of the Royal Australian Naval Volunteer Reserve who served in the extremely dangerous role of mine disposal during the Second World War. Courage of a different sort was displayed by two prisoners of war who endured terrible suffering. Captain Lionel Colin Matthews was eventually executed by his captors for building a resistance network in British North Borneo in the Second World War,  while Private Horace William Madden, captured in Korea in 1951, died of privations while assisting fellow prisoners and openly resisting enemy efforts to force him to collaborate. The last Australian to be awarded the GC (in 1978) was Constable Michael Kenneth Pratt of the Victoria Police, Melbourne, for arresting two armed bank robbers in June 1976. A memorial to Australian recipients, George Cross Park, was opened in Canberra, the Australian capital, on 4 April 2001 by the Governor General of Australia, Sir William Deane. Holders of the Victoria Cross or the George Cross are entitled to an annuity, the amount of which is determined by the awarding government. Since 2015, the annuity paid by the British government is £10,000 per year. In Canada under the Gallantry Awards Order, members of the Canadian Forces, or people who joined the British forces before 31 March 1949 while domiciled in Canada or Newfoundland, receive $3,000 per year. Australia has been responsible for the payment of both the Victoria Cross Allowance and the George Cross annuity since the 1940s. The Victoria Cross Allowance which includes both the Victoria Cross for Australia and the British Victoria Cross is included in s.103 of the Veterans' Entitlement Act and is presently $A4,447.00 per year. Although there is not a statutory instrument for the payment of the George Cross annuity, both annuities for the Australian Cross of Valour and George Cross match the Victoria Cross Allowance payment. ↑ "No. 61969". The London Gazette (8th supplement). 16 June 2017. p. 11774. ↑ "No. 56878". The London Gazette (Supplement). 17 March 2003. p. 3351. ↑ The phrase "in the presence of the enemy" was inserted into the Victoria Cross Warrant in 1881 and continues in the present warrant but is often misquoted as "in the face of the enemy". 1 2 "George Cross Database". Archived from the original on 14 May 2011. ↑ "No. 35060". The London Gazette . 31 January 1941. pp. 622–624. ↑ "No. 35141". The London Gazette (Supplement). 18 April 1941. p. 2285. 1 2 George Cross Database. Retrieved on 12 September 2007. ↑ "No. 45566". The London Gazette . 6 January 1972. p. 171. ↑ "No. 45566". The London Gazette . 6 January 1972. p. 172. ↑ The awards to Malta and the RUC were not gazetted. The Exchange awards are not gazetted although the original EGM, AM and EM announcements were gazetted. 1 2 Letter from Roger Smethurst dated 20 April 2012 , released as part of a response from Cabinet Office to a request made using WhatDoTheyKnow , accessed 2 August 2012. ↑ "George Cross for Army Afghanistan bomb heroes". BBC. 18 March 2010. Retrieved 18 March 2010. ↑ Grove, Dr Eric (17 February 2011). "The Siege of Malta in World War Two". BBC. Retrieved 15 April 2007. ↑ Turner, John Frayn (2010). Royal Ulster Constabulary. 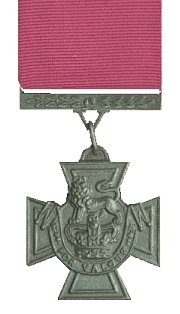 Awards of the George Cross 1940–2009 (2 ed.). Pen & Sword Books Ltd. p. 165. ISBN 978-1-84884-200-7 . Retrieved 24 February 2015. ↑ "'New era' as NI police change name". BBC News. 4 November 2001. Retrieved 24 February 2015. ↑ David Matthews. (2008). The Duke: A Hero's Hero at Sandakan. Captain Lionel Matthews GC, MC. Seaview Press, West Lakes, South Australia. ISBN 978-1-74008-486-4. ↑ Michael Ashcroft. (2010). George Cross Heroes. Headline Publishing, London. pp. 249–251. ISBN 978-0755360840. Wright, Christopher J.; Anderson, Glenda M., eds. (2013). The Victoria Cross and the George Cross: the complete history (3 vols). York: Methuen & Co. ISBN 978-0-413-77752-2. Wikimedia Commons has media related to George Cross . Search recommendations for the George Cross on The UK National Archives' website. "Stolen from Himachal, George Cross to go under hammer in UK", Times of India , 26 November 2009. The Distinguished Conduct Medal, post-nominal letters DCM, was established in 1854 by Queen Victoria as a decoration for gallantry in the field by other ranks of the British Army. It is the oldest British award for gallantry and was a second level military decoration, ranking below the Victoria Cross, until its discontinuation in 1993 when it was replaced by the Conspicuous Gallantry Cross. The medal was also awarded to non-commissioned military personnel of other Commonwealth Dominions and Colonies. The Distinguished Service Cross (DSC) is a third level military decoration awarded to officers, and since 1993 ratings and other ranks, of the British Armed Forces, Royal Fleet Auxiliary and British Merchant Navy, and formerly also to officers of other Commonwealth countries. The Distinguished Service Medal (DSM) was a military decoration awarded until 1993 to personnel of the Royal Navy and members of the other services, and formerly to personnel of other Commonwealth countries, up to and including the rank of Chief Petty Officer, for bravery and resourcefulness on active service at sea. The Military Cross (MC) is the third-level military decoration awarded to officers and other ranks of the British Armed Forces, and formerly awarded to officers of other Commonwealth countries. The Air Force Cross (AFC) is a military decoration awarded to officers, and since 1993 other ranks, of the United Kingdom Armed Forces, and formerly also to officers of the other Commonwealth countries. It is granted for "an act or acts of exemplary gallantry while flying, though not in active operations against the enemy". A bar is added to the ribbon for holders who are awarded a further AFC. A member of the armed forces mentioned in dispatches is one whose name appears in an official report written by a superior officer and sent to the high command, in which his or her gallant or meritorious action in the face of the enemy is described. The Military Medal (MM) was a military decoration awarded to personnel of the British Army and other arms of the armed forces, and to personnel of other Commonwealth countries, below commissioned rank, for bravery in battle on land. The award was established in 1916, with retrospective application to 1914, and was awarded to other ranks for "acts of gallantry and devotion to duty under fire". The award was discontinued in 1993 when it was replaced by the Military Cross, which was extended to all ranks, while other Commonwealth nations instituted their own award systems in the post war period. The Conspicuous Gallantry Cross (CGC) is a second level military decoration of the British Armed Forces. Created in 1993 and first awarded in 1995, it was instituted after a review of the British honours system to remove distinctions of rank in the awarding of gallantry decorations. The Victoria Cross is the only higher combat gallantry award presented by the United Kingdom. The Air Force Medal (AFM) was a military decoration, awarded to personnel of the Royal Air Force and other British Armed Forces, and formerly to personnel of other Commonwealth countries, below commissioned rank, for "an act or acts of valour, courage or devotion to duty whilst flying, though not in active operations against the enemy". The award was discontinued in 1993 when all ranks became eligible for the Air Force Cross (AFC) as part of the reform of the British honours system. The British Empire Medal is a British medal awarded for meritorious civil or military service worthy of recognition by the Crown. The current honour was created in 1922 to replace the original medal, which had been established in 1917 as part of the Order of the British Empire. The Queen's Gallantry Medal (QGM) is a United Kingdom decoration awarded for exemplary acts of bravery by civilians, and by members of the Armed Forces "not in the face of the enemy", where the services were not so outstanding as to merit the George Cross or the George Medal, but above the level required for the Queen's Commendation for Bravery. The Victoria Cross (VC) is the highest and most prestigious award of the British honours system. It is awarded for gallantry "in the presence of the enemy" to members of the British Armed Forces. It may be awarded posthumously. It was previously awarded to Commonwealth countries, most of which have established their own honours systems and no longer recommend British honours. It may be awarded to a person of any military rank in any service and to civilians under military command although no civilian has received the award since 1879. Since the first awards were presented by Queen Victoria in 1857, two-thirds of all awards have been personally presented by the British monarch. These investitures are usually held at Buckingham Palace. Frederick Hamilton March, was an Australian soldier and adventurer. He served in the Middle East during the First World War. He received the Empire Gallantry Medal, then the highest civilian gallantry award in the British Empire, for his conduct during the assassination of the Governor-General of Sudan, Sir Lee Stack. He was involved with the Sudanese Ministry of Agriculture during his later working career. William John Button was a British soldier and one of the last recipients of the Empire Gallantry Medal before this award was superseded by the George Cross.